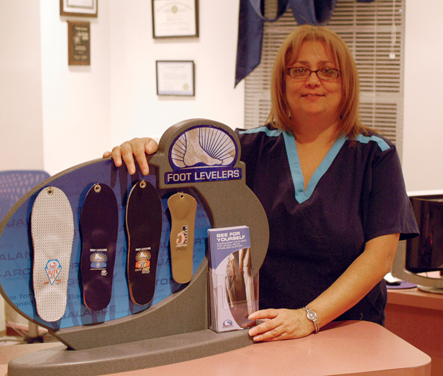 We offer digital foot scans and custom made soft spinal pelvic stabilizers (orthotics) by Foot Levelers. Many people are not aware that if their feet are not properly supported that it can affect other parts of their bodies such as knees, hips, and the spine. By properly supporting the arches of the foot, spinal pelvic stabilizers help the feet maintain their structural and functional balance when standing, walking, or running. Stabilizers give the stable foundation that you need for a properly aligned body, which helps to reduce unnecessary stress on your joints and in turn reduces pain. Foot Levelers offers several different styles of stabilizers that can be used in athletic shoes, dress shoes, and even women's heeled dress shoes.